Cherokee and Wrangler use a blend-air heater system. 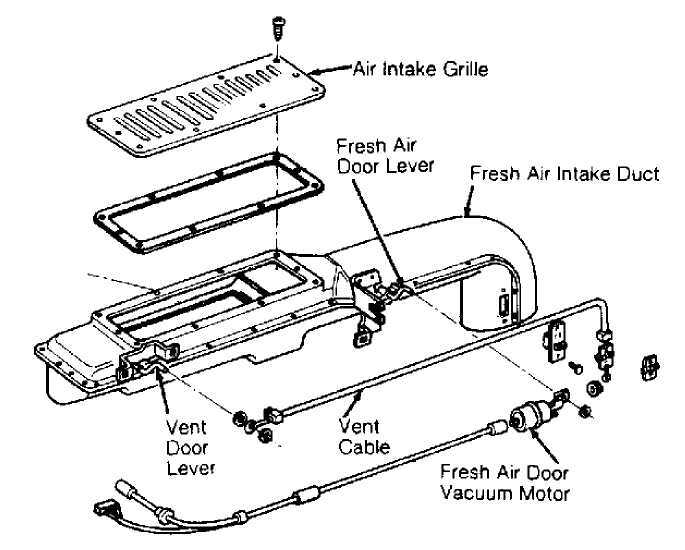 Temperature of air entering passenger compartment is controlled by regulating amount of airflow through heater core and then blending it with a controlled amount of cool air that by-passes the heater core. The upper control lever on the control panel operates a vacuum switch on back of control panel. Vacuum switch controls vacuum to defroster, floor and panel vacuum motors, as well as a vacuum-actuated heater coolant control valve. See Figs. 1 and 4. The heater coolant control valve closes when vacuum is applied to it. The lower control lever on the control panel moves a cable that controls the position of the blend-air door in the heater case. Fig. 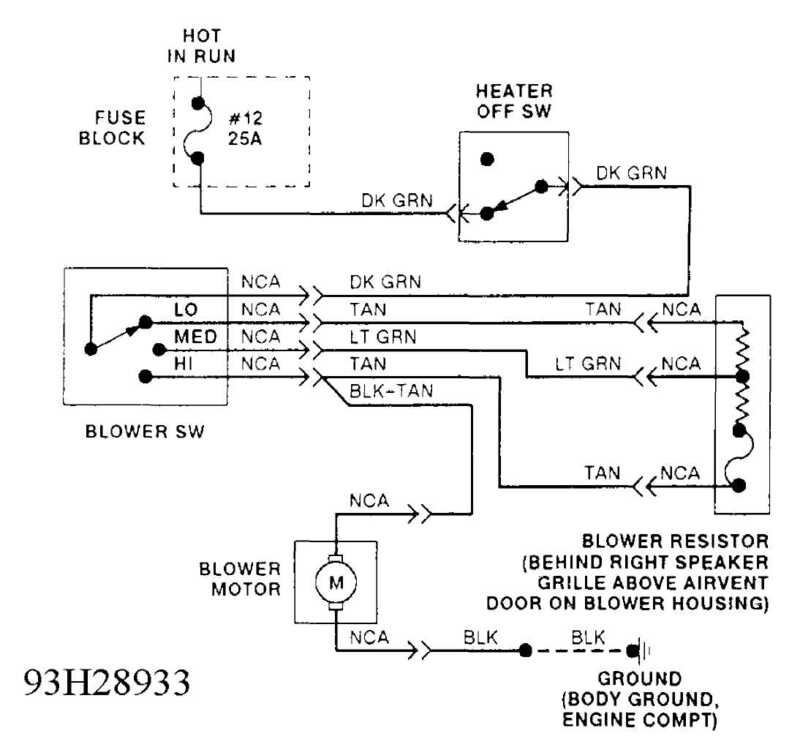 1: Heater System Operation (Cherokee) Courtesy of Chrysler Corp. NOTE: System does not use a heater coolant control valve. Coolant always flows through the heater core. vacuum switch allows or denies vacuum to the fresh air door vacuum motor. The lower lever on the control panel moves a cable that controls the position of the blend-air door in the heater case. Fig. 2: Exploded View Of Air Intake System (Wrangler) Courtesy of Chrysler Corp. Fig. 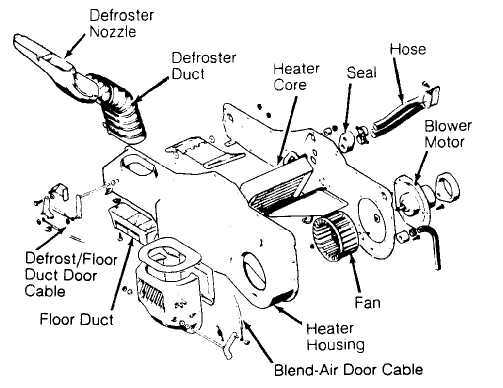 3: Exploded View Of Heater Case (Wrangler) Courtesy of Chrysler Corp. Temperature control cable is attached to blend-air door lever by a retaining clip and a self-adjusting clip. When connecting cable to door lever, self-adjusting clip will adjust cable when it is snapped into position on lever. cables in correct sequence. This maintains self-adjusting mechanism. doors open at same time. Blown fuse. Loose connection or poor ground. Faulty switch, motor or resistor. Air inlet blocked. Fan not attached to motor shaft. Inoperative air inlet door. Blend-air door cable misadjusted. Blend-air door binding in housing. Defroster duct misaligned. Defroster cable incorrectly adjusted. Leaking air duct seals. Defroster duct damaged. Low coolant or plugged heater core. Incorrect thermostat. Incorrect adjustment of cables. Heater system air leaks. Blend-air door not in proper position. blower motor. Remove blower motor screws. Remove blower motor. To install, reverse removal procedure. Remove coolant bottle retaining strap. Move bottle aside. as an assembly (if equipped). Move assembly aside. Remove heater housing. See HEATER HOUSING. Remove blower motor screws and blower motor. To install, reverse removal procedure. Remove control panel. See CONTROL PANEL. Disconnect cable wire from blend-air door lever. Squeeze cable housing tabs together using needle-nose pliers to detach cable housing from slot in case. DO NOT break cable housing. Remove cable. Connect cable wire to blend-air door lever. Snap cable housing tabs into slot in case. Route cable to control panel. Connect cable wire to control panel. Install control panel. Disconnect cables from vent doors. Disconnect cables from control panel levers. Remove cables by squeezing tabs using needle-nose pliers. Remove cable. Connect and adjust cables. See ADJUSTMENTS. fitted to instrument panel). Remove radio (if equipped). heater core out of housing. install remaining components, reverse removal procedure. Remove heater housing. See HEATER HOUSING. Remove cover from housing. Remove heater core from housing. To install, reverse removal procedure. Disconnect negative battery cable. Drain cooling system. motor. Remove console (if equipped). Remove lower instrument panel. remove housing screws. Remove right kick panel. installation. After installation, fill cooling system. coolant from radiator. Disconnect heater hoses from core tubes. engine compartment, near blower motor. Disconnect defroster duct. compartment firewall. Tilt heater housing downward to disengage it from defroster duct. Pull heater housing rearward and out from under instrument panel. To install, reverse removal procedure. Fig. 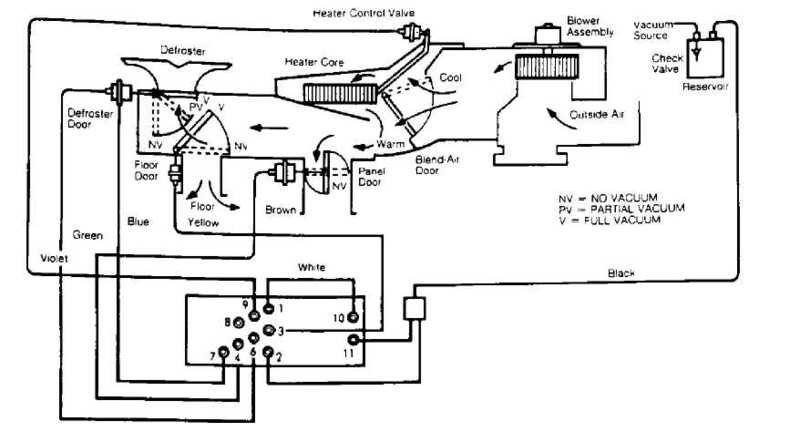 4: Heater Control System Vacuum Diagram (Cherokee) Courtesy of Chrysler Corp.